Capitol Cider House Is Coming to D.C. in 2018 | Cider Bars in D.C. The up and coming Petworth neighborhood in Washington, D.C. will soon be home to a new place to explore craft cider: Capitol Cider House. This stylish—but still family-friendly—spot will offer some housemade ciders (very exciting! ), as well as artisan ciders from throughout the mid-Atlantic region, including Virginia, Maryland and Pennsylvania. Capitol Cider House’s ciders will be hand-pressed on site from apples grown in the region, and all the leftover pomace will be donated to nearby farms for animal feed and composting. The space was designed by Arium AE, a local integrated design studio that, over the past few years, has assisted a dozen or more startup cideries, breweries and distilleries. 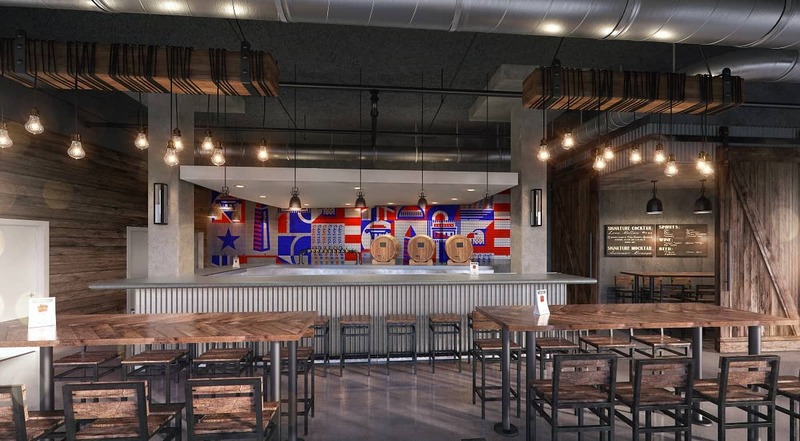 Capital Cider House will sport a clean industrial aesthetic, featuring reclaimed wood planking, over sized barn doors, corrugated metal panels, exposed concrete surfaces and a vibrant mural. Guests will be able to get a peek into the production area where the cider will be made and stored to age in a wall of wood barrels. We had the chance to sit down with the company’s founder, Jared Fackrell, to ask some questions about his awesome-sounding new cider bar. Cider Culture: Can you tell us a bit about yourself, and the history of Capitol Cider House? Jared Fackrell: Sure, but just a tiny bit so we can focus more on cider!I’ve been working in or for the public sector most of my professional life. The idea of launching Capitol Cider House came about fairly recently. The catalyst was a family vacation up to New York that ended in a trip to the Finger Lakes Cider House, a phenomenal spot for anyone who hasn’t been. The whole experience really made me think differently about the beverage. And so it started. One thing sort of led to another after that. What do you love about cider? What’s not to love about a naturally gluten-free drink? It’s tough to think of a more versatile beverage. It’s great to drink by itself, a lovely addition in cocktails and even better when paired with food. And the broad diversity of cider styles, especially in the Mid-Atlantic, can appeal to most any palate. How did you decide on your location in D.C.? The location made sense on a number of levels: Petworth is a super vibrant, family-friendly neighborhood—did I mention that my wife and I have two little kids?—in need of more food and drink options. The cider house will sit two blocks away from Upshur Street, which the Washington Post just reported as ‘the best place to eat in D.C. right now.’ Plus, it’s metro accessible (two blocks from the Georgia Ave.-Petworth station) on a very pedestrian friendly stretch of Georgia Avenue. What’s the response to the news of you opening been so far? Lots of excitement as we join the city’s burgeoning cider scene! As a recent example, I provided a live demonstration of apple milling and pressing using a hand operated crusher and a traditional basket press at Petworth’s neighborhood festival earlier in the month. Some folks hadn’t experienced fresh-pressed cider since childhood and for others it was completely new and exciting. It gave a small taste of what Capitol Cider House will deliver—that is, a neighborhood spot where folks can easily gather with their families and have a good time. Can you share a bit about the space? The space is 2,840 square feet, with about an 80-person occupancy inside plus another two dozen seats outside. Our beverage program will include a 12-tap draught system, generally 10 ciders, a beer and a mead; an extensive bottle list of local ciders, meads, wines and beers; bottles and growlettes to go; and fresh-pressed sweet cider! For the food menu, we’re partnering with at least one food start up out of D.C.’s prominent food business accelerator, Union Kitchen. We’re not quite ready to reveal anything further, but the food will complement our beverage program and add another dining option for the neighborhood. Sounds great! When’s the expected opening date? I know that’s not quite what you want, but we’re working through local permitting and licensing right now, and a build out of the space will follow thereafter. The gestation period for all of those processes can vary wildly so we’re relying on our growing social media presence (@CapCiderHouse) to pass along key updates on our journey toward opening. Capitol Cider House will be located in the Fahrenheit building at 3930 Georgia Ave. NW in Washington, D.C.